I own/operate SO CAL TRIKE CENTER and Dusk to Dawn Motorcycle Service. I have always been kinda mechanical, taking things apart to see how they work. It always made me wonder about electronics, you know, no moving parts; how did it work!? So I joined the Marines and learned electronics. They trained me on radar. I was a Radar Tech. As a civilian I worked in electronics for many years, working on Marine Corps Huey and Cobra Helicopters, HBO TV descrambler boxes, VCR's, I did QC, production, and repair of all types of stuff. I even worked on neonatal ventilators for a few years and was a Final Checkout Technician on the cruise missile when they were made by General Dynamics in Kearny Mesa. But I wasn't happy, so I quit General Dynamics and went to MMI, Motorcycle Mechanics Institute, in 1987. I graduated and went right to work at H-D South in Perrine, Fla. I moved back to California as soon as I could and was at South Coast H-D as a Mechanic, then I was the Parts Manager at San Diego Harley-Davidson when Doc owned it. I started doing mobile service and then got a "real" shop in 1991 and I love it! Best thing I ever did! I found what I like to do so it aint work, most of the time anyway. Then in 1994, we became the 1st Lehman dealer here in California. It was at this time we started to also work on the Goldwing doing trike conversions and service. The Honda Goldwing really opened my eyes to a whole new world! "Amazing" SO CAL TRIKE CENTER is also a Champion and California Side Car trike, trailer and side car dealer too! We are the ONLY one to do all four of the BIG BOYS and the oldest trike dealer here in California. 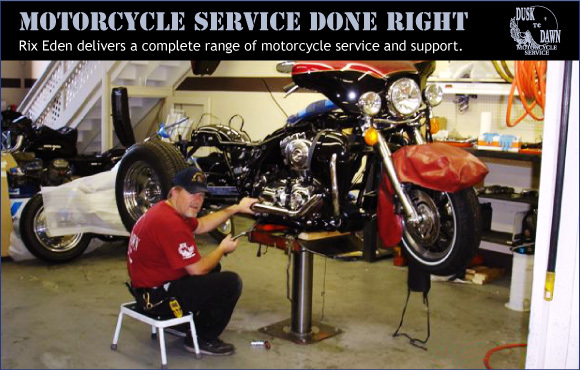 So if'n you want your trike, whether it is a Honda or a Harley built, or serviced, or maybe you want something custom, we can do it! Stop by and say "Hi!"